You’ve most likely based your retirement planning on an estimate of how long you will live. The good news is that you probably underestimated. The bad news is the same. According to the Society of Actuaries, 40% of retirees underestimate the life expectancy of people their age by at least five years. That can add up to a lot of unexpected living expenses at the end of one’s life. American men and women born today have average life expectancies of 76.5 years and 81.3 years, respectively. But these numbers are deceptively low because of people who die young. So by the time you reach your 50s, the averages no longer apply. The stark reality is that if you’re lucky enough to be in that higher-end group, you need to prepare for a retirement period of at least 30 years, and it would be prudent to plan for up to 40 years. You may live to be 100—or older. One of the conventional guidelines used for asset allocation is the percentage of invested assets you should allocate to stocks: 100 minus your age. Using this rule of thumb, a 65-year-old should invest 35% of his portfolio in stocks and the balance in bonds. But the math for a bond dominated portfolio simply doesn’t work for long retirement periods. Consider a married couple in their first year of retirement with a $2.2 million nest egg, $50,000 in combined Social Security income, and annual living expenses of $150,000. They need their portfolio to generate $100,000 in annual income to fund the shortfall. Further, the couple has a self-described “conservative” risk profile, and they are attracted to the “safety” and comfort of bonds, where there is no risk of principal. Let’s assume that this couple could invest their savings in high-quality, long-term corporate bonds yielding 6% (the compounded return over the last nine decades). The first year, they’d have a significant cushion. Their investment income of $132,000 ($2.2 million x 6%) would be a third more than their income needs of $100,000. So far, so good. Next, consider that their living expenses will increase 3% per year, the historical average inflation rate over the last 90 years. At this rate, their cost of living will double over 25 years, and what costs $100,000 today will cost $242,726 in 30 years. The erosion of purchasing power is slow, insidious, constant…and all but invisible on any given day. For about the first 10 years, the couple would have enough income. 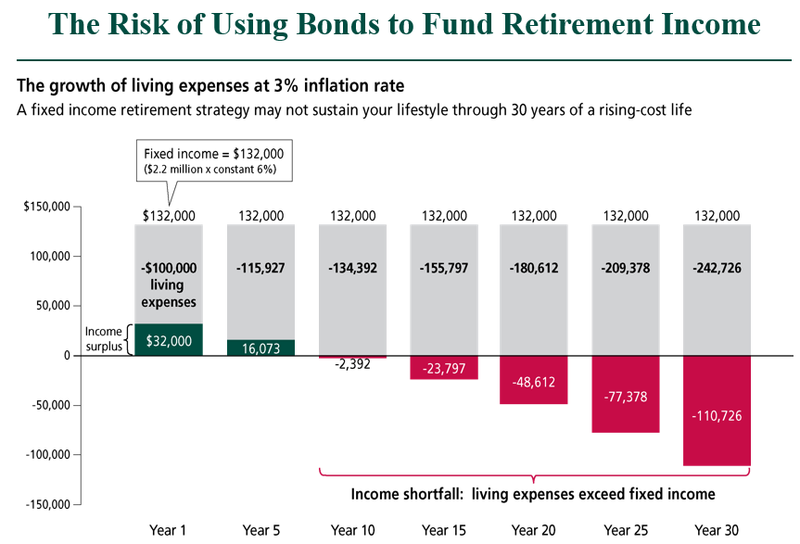 But as the following chart illustrates, after year 10, the couple’s living expenses would dramatically outstrip their annual fixed income of $132,000. As they grow older, they turn upside-down financially—not a place anyone wants to be. You may have heard that there are only two basic investment objectives: growth and income. Buy stocks for growth and bonds for income. We all know how to define risk and safety in terms of principal—the risk that we’ll lose our money and the assurance that we won’t. That’s second nature to us, and it’s probably uppermost in our minds when we think about retirement investing. But with three- and four-decade retirements, investors must think as much about the risk of outliving their money as the risk of losing it. We must define risk not just in terms of principal but in terms of purchasing power. When it comes to accretion of purchasing power, one asset class outshines all others: equities. Over time, equities—not bonds—have been the best way to preserve and grow purchasing power. Since 1926, equities have delivered a 7% return after inflation for large-company stocks—more than double the 3% real return for bonds. In modern three-decade retirements, where the maintenance of purchasing power becomes a fundamental objective, there’s a third, crucial, investment objective: growth of income. Since 1975, the S&P 500 dividend has increased 13x (from $3.7 to $48.2 in 2017), or at a compounded growth rate of just about 6%—about double the rate of inflation over the same period. The following chart assumes a $10,000 initial investment in both stocks and bonds at the beginning of 1976. It also assumes that the dividends or interest payments are taken as income, not reinvested. What are the results? In the first year, bonds generated interest income of $745, and stocks provided dividend income of $461. Fast-forward to 2014, where bonds generated $253 in income and stocks generated $4,452—17x more. But that’s not even half the story. Let’s look at capital appreciation. The ending principal value of a $10,000 initial investment in bonds was $11,232. For stocks, the ending value of a $10,000 initial investment was $228,283—a difference of 20x. To be sure, we’re not advocating for an all stocks, all the time approach to asset allocation. Retirees should set aside an amount sufficient to cover two years’ worth of living to enable the suspension of equity withdrawals if a long or steep bear market strikes relatively early in retirement. People also need to set aside a capital sum for any known future commitments that will become due and payable within five years, and invest it in bonds with a corresponding maturity. 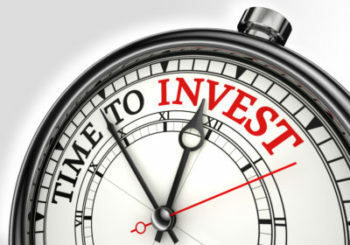 In most circumstances, the remainder of the portfolio should be invested in equities. Time is on your side; bonds are not. Anchoring is a cognitive bias that describes the human tendency to rely too heavily on the first piece of information offered when making decisions. If you anchor on the age when your parents or grandparents died, or “average” life expectancy numbers, you may significantly underestimate the number of years you will be retired, the annual income you will need in retirement to cover ever-rising living expenses, and the capital sum needed to support your retirement period.